A brief note from John Hughes at Hugheship this morning tells me that the price of his central agency listing, the 50m luxury motor yacht Polarsyssel, has had another price cut. Built in 1976 by P. Hoivolds mek Versed, in 1976, she was converted into a superyacht in 2007, with accommodation for six guests in three staterooms. 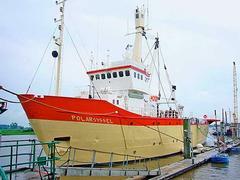 She has an icebreaker hull and comes complete with helipad and helicopter storage space below decks. Previously marketed at €3.5 million, she's now asking €2.9 million.